Textbook Mommy: How Can I Reduce My Anxiety at the Dentist? How Can I Reduce My Anxiety at the Dentist? For most people, the real problem with going to the dentist isn't the pain or discomfort that comes with their procedures. It's the anxiety that builds up before the appointment. The fear and expectation can be a lot worse than the reality. Whether you are dealing with an orthodontic specialist, or just general dentistry work, a few easy tips can ease your mind before your next appointment. One of the first steps is to talk over your dental fears with your dentist. A good dentist will discuss all the details with you (see the next point), and can take extra steps to make you comfortable. They can take it slower, add a little additional freezing or sedative to help you relax, and can take more breaks to help you get through the procedure as stress-free as possible. Not everyone has the same thresholds for pain or discomfort. Don't assume that your dentist knows precisely how you feel at each moment. Information can go a long way in relieving your fears. Many procedures are virtually painless, so there is no sense being afraid of the pain when there won't be any. It's the uncertainty of the unknown that makes us nervous. Ask your dentist for lots of details, or do a little research online to see what's involved. 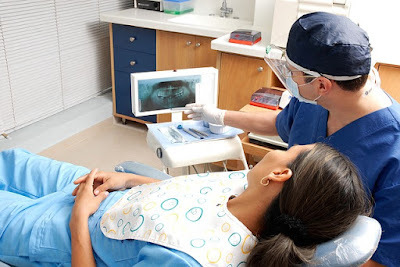 Distraction can be a huge help during a dental procedure. This is one reason why a good dentist chats with you while working. When you're not focused on your mouth, you don't notice the sensations as much. Of course, with tools or fingers in your mouth, it's a little impractical to engage in return conversation but you can pay attention to what he or she is saying and focus on that instead of the work. Not enough? Bring a friend with you to help with the conversation, or arrange to have some of your favorite music playing during your appointment. You may not be able to wear headphones though, so ask ahead how to get hooked up for your tunes. Whatever you do, don't let your fear of the dentist keep you from getting necessary medical care. A mild routine check-up is worth facing because it can save you from much harsher treatments later as cavities develop, gums get inflamed and infections start to spread. Even if there is no pain in your mouth, and it doesn't feel like there is anything wrong, stick to a schedule of annual checkups. Skipping appointments can almost certainly result in more serious problems in the future, and it can also make anxiety worse by letting your memory get the best of you. When you go to the dentist for a check-up each year, it's easier to remember that it's not really that bad. If you haven't been to the dentist in a decade, your memories will be less accurate and you can convince yourself that it was terrible.